Fall is my favorite time of the year. The dog days of summer are over, the weather is awesome, the leaves are beginning to turn different colors and my grass is turning brown and I want have to cut it for the next six months. But, the best thing about the fall is football season. I love to watch High School, College and Professional Football. During the fall season on Saturday, Sunday, Monday, Thursday and Friday I am watching or listening to a football game. I love every aspect of football except one part and that is the huddle. I sometimes think the huddle is a waste of time. It slows the pace of the game down. It can take a team out of its flow. My opinion of the huddle is that it can be facilitated in a more strategic way. I definitely understand the importance of why a team huddles. A team huddles to prepare itself for the next play, bring in the right players to execute that play and give other players a breather. The modern era of football is played at a faster pace with more skilled players and better technology. Coaches have taken advantage of this by incorporating the no-huddle offense in their repertoire. Offensive coordinators devise a game plan that institute several plays that they can run without gathering in a huddle after each play. This strategy is used to keep the defense off balance and helps the offense stay in their flow. Today’s football teams use the huddle, but in a more strategic way conducive to that team’s game plan. Wouldn’t it be a shame if football was nothing but a huddle; a meeting to talk about how to execute a play, but never actually breaking the huddle and snapping the ball? It wouldn’t be much of a game. Isn’t it a shame when we spend more time in our life huddling rather than carrying out our vision? What good is it for you to know your vision and what it takes to make it happen, but never act upon it? What good does it do for you to get insight from others, read books and attend seminars, but never implement the strategies you learn? I have listened to and read some of the best strategies from many experts on how to live out your vision successfully. My problem is not the lack of knowledge, but the problem of not consistently implementing the knowledge I learned. I felt I was missing something or I didn’t know enough. Instead of taking action on what I know to live out my vision, I stayed in my huddle. I had to read another experts book or blog post. I had to go to a better seminar or study more material before I launched out. The huddle was my comfort zone. Don’t get me wrong, nothing is wrong with getting sound counsel from others, reading someone’s book or blog to get different insights or attending a seminar or workshop to enhance your skills. You cannot live out your vision on an island to yourself. But, you cannot afford to stay in your huddle gathering and collecting more information. You cannot wait on some guru to give you a miracle play. You cannot forfeit opportunities waiting for someone to give you permission to move. It is time to break your huddle and get something done. You may have to start out small, but starting small is better than not starting at all. You may fail in the beginning, but pick yourself up, recalibrate and go back to work. You may not get encouragement from others, encourage yourself. What if you paid your hard earn money to see your favorite football team play and they never break the huddle? Your team charges out of the locker room energized and excited to play. The stadium is packed, the fans are cheering and waving their team banners and the hype music is blaring over the intercom. Your team wins the coin toss and decides to receive the ball first. You stand to your feet to cheer your team on to victory. After the kickoff, your team gets the ball on the twenty yard line. 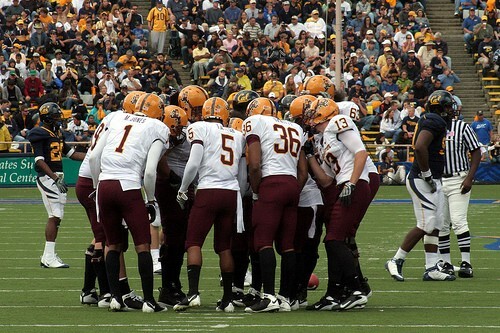 The offense leaves the sidelines and goes to the huddle to initiate the play. You and the fans are standing and cheering, but your team never breaks the huddle. After a fifteen yard penalty, they still refuse to break the huddle. This would upset and anger you and the fans because you came to see your team play the game and not stay in a huddle. I know this probably will not happen, but if it did you would demand your money back. This is your life and you can’t demand a refund for not breaking your huddle. It is your responsibility to make your move. You have read enough how to strategies. You have gone to enough conferences and workshops. You have gotten enough opinions and ideas to last a lifetime. It is time to let go of the huddle’s comfort. It is time to fight through the fear of stepping out. It is time to break your huddle and put your vision in motion. Don’t get me wrong the huddle is a great place to gather instruction and insight. It is perfect for regrouping and recalibrating for a different play. It is great for gathering together to make sure everyone is on the same page. But, if you desire to make your vision a reality you must break your huddle and participate in life. If it is a book, write it and market it. If it is a business idea, develop your strategy and implement your plan. If it is blog website, design it, start writing and launch your blog. Whatever you need to do to achieve your vision, do it. A huddle is necessary for preparation, but it was not meant to stay in it forever. It was designed to disseminate the play to all those connected to it. Don’t let your huddle be a long process of meetings, researching, planning, talking, wishing, dreaming and NO ACTION! Break your huddle today and live the vision you were destined to live. Question: What vision(s) have you forfeited because you are still stuck in your huddle? Leave a comment.